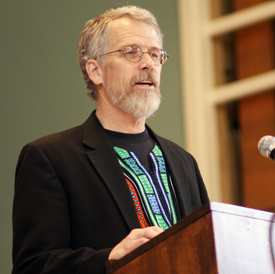 Howard W. Hewitt – Most faculty and staff members at Wabash College take their role as mentors very seriously. We all do it in different ways. My interest in wine has snuck on to the pages of Wabash Magazine and the website on more than one occasion. So when the folks at Career Services asked me to lead a wine education event for seniors, I was really excited. 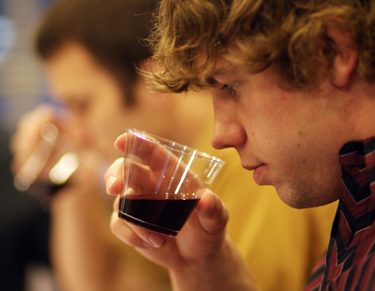 We had approximately 20 Wabash men Wednesday, April 27, attend to learn wine basics, restaurant protocol, wine etiquette, and how to taste and evaluate new wines. But the whole point of the session was as much about business as it was wine. “Students don’t necessarily understand that we have a variety of resources to help them tremendously,” Director of Career Services Scott Crawford told The Bachelor. “The wine tasting and the golf outing we have coming up are both based on teaching students how to develop themselves,” Crawford explained. “You never know who you’re going to be dealing with and what your role may be in hosting them. Freshman Ian Baumgardner was at the event, not tasting, shooting photos for The Bachelor. Here is a an album of his photos. 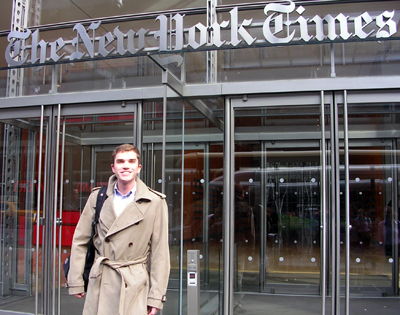 Riley Floyd ’13 – Last week, I had the opportunity to attend a symposium for collegiate newspaper editors co-sponsored by the Council of Independent Colleges and The New York Times. The less than 24 hours that I spent in New York were absolutely incredible, and I did so much in that short amount of time that it felt like I was in the city for much longer than I actually was. At the risk of “hiding the ball,” I’ll give you a summary of my time in Gotham before recapping the day at the Times. I took a 5:30 plane out of Indianapolis on Thursday afternoon. I did some reading for my Friday classes on the plane and flew into JFK on one of the clearest days I’ve seen in the sky. The weather was beautiful—a perfectly spring-like 60 degrees. I took the AirTrain from the terminal and transferred to the subway in Queens at Jamaica Station. I took the E uptown to 42nd Street and 8th Avenue. I had been in the city once before, so I knew my way around midtown Manhattan decently well. Walking through Times Square to my hotel at 44th Street at 7th Avenue wasn’t the most pleasant or non-claustrophobic experience, but I managed! I checked into my hotel and set about finding a dinner spot. I settled on Bobby Van’s Grill. Let’s put it this way, I didn’t want to leave the restaurant. Bobby Van’s is a steakhouse chain that began in the Hamptons. They now have over nine locations spread throughout New York and Washington, D.C., and they pride themselves on catering to the likes of Truman Capote and other members of the literary scene. Needless to say, when I saw that on the menu, I knew I had made the right choice. And, late at night, it was great to just sit in the window and watch the people walk by. I went back to my hotel and tried to hit the hay early to get up early the next morning for a run in Central Park. The goal was 5 a.m.
5 a.m. didn’t happen. But 6:40 did! I got up and forewent the idea of a run and decided instead to make just a few stops along the way to enjoying a quick walk in the Park. I made my way over to Rockefeller Plaza (at 49th and 50th Streets between 5th and 6th Avenues) for a stop at Dean & Deluca for a chocolate croissant and coffee. I walked through the Today Show crowd, grabbed breakfast to go, and made my way up 5th Avenue to the Park. Perhaps not surprisingly for 7 a.m. on a Friday, 5th Avenue wasn’t too busy. And that was an awesome change of pace. Last time I was in New York, I was on 5th Avenue during the afternoon, so it was relatively crowded. This time, I could take my time. Central Park made the 6:40 a.m. wakeup completely worth it. I love the Park, and it’s one of my favorite parts of the City. I pretty much promised myself that I wouldn’t make another visit to the city without going to the Park. I mostly stayed around the Pond just inside of 59th Street; I didn’t have time to go too far. And seeing the runners on their morning runs made me immediately regret the fact that I didn’t have the will power to tread the same trail. Nonetheless, I snapped a few great pictures before walking back to the hotel to check out and get ready for the Times symposium. I walked to the Times building at 41st and 8th Avenue. Wow. Constructed in 2007, the building is a completely modern, 52 story building with 95,000 square feet of space. And, there’s a Dean & Deluca on the ground floor. Not bad at all. The symposium was on the 15th floor in the conference center. 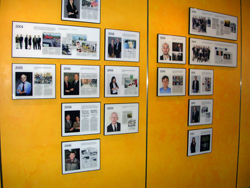 Outside of the conference rooms hang the 104 Pulitzer Prizes that the Times has won for its work over the years. Later in the day, I won a Starbuck’s card for remembering that little fact. No, I didn’t Google it. It was on the back of a pamphlet about the building that we all received at the start of the symposium. I took a seat and sat with students from Swarthmore, Stony Brook, Towson, and Rutgers. Indeed, a variety of schools both large and small had some of their editors there—including two editors of the Yale Daily News, a paper that I use frequently as a model for design and story ideas. The Times' hallway of Pulitzer Prize winners. We first heard from Bill Schmidt, the Deputy Managing Editor of the Times. He spoke about the paper’s commitment to journalism and its role within society. Believe it or not, the Times newsroom is as large now as it was 10 years ago with 25 foreign bureaus and 12 domestic bureaus. And, Schmidt compared the disruption in the wake of the digital revolution to the disruption that arose after Gutenberg invented the printing press. Schmidt gave an interesting talk about the Times evolution over the years and about the publication’s ethos that hasn’t really changed much at all. We also heard from Don Hecker, Manager for Staff Editor Training; James Dao, National Correspondent for Military and Veterans’ Affairs; Neil Amdur; and Sandy Keenan, Environment Editor. Hecker took us through some editorial exercises and talked about entry-level copy editor positions at the Times. Dao spoke on the risks and rewards of being a foreign correspondent. He’s currently working on a series on an Army battalion’s deployment to Afghanistan and its effect on military families. He “embeds” with them on their trip overseas, comes back home, returns a few months into the tour, and then comes back home with the troops. Amdur has had a fascinating career in the world of sports journalism, and he gave some great, witty career advice. And Keenan, the former Sports Editor, spoke on covering the Beijing Olympics. Interestingly, she just became the Times environment editor, but spent the last nearly 30 years of her career as Sports editor. That cross blending of interests and experiences really stood out to me during my time at Times. Indeed, I think that’s what makes the publication as intriguing as it is. While all of their talks and facts are too detailed to share here, I can say that the best part of the whole experience was seeing these professionals in their own environment. No, we didn’t get a tour of the newsroom. But it was awesome to see the faces behind the names on the masthead. The people we met on Friday are some of the most brilliant journalists I’ve ever encountered. Some are bookish and have Master’s degrees in journalism. Others never even graduated college. Nonetheless, their commitment to their work and their enthusiasm for it is one of a kind. Attending the symposium right before finals was perfect. It gave me a chance to get away, clear my head, and to see the rewards of really taking pride in your work. Oh, and did I mention that I got a free copy of the Times?! Riley Floyd, Noblesville, In., is Editor of The Bachelor. His trip was funded by the Tim Padgett ’84 Editor’s Fund and the College Dean’s Office. Howard Hewitt -Ever walk through an airport and spot someone with a Wabash sweatshirt or ballcap? Immediately there is a bond from a shared experience. That rings true even if you’re not a Wabash student or alum! It happens to me all the time, particularly in Indianapolis. 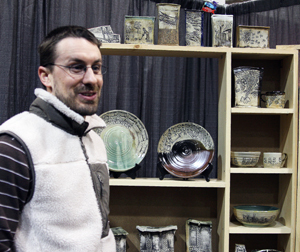 The first-ever Indiana Artisan Marketplace was held at the State Fairgrounds April 16-17. A friend and I decided to go shortly after learning about the Indiana Artisan group. Essentially, it’s a juried membership that features some of the state’s best talent. 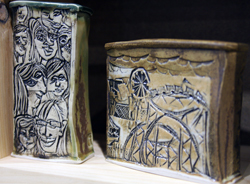 The show featured more than 150 Indiana Artisans and another 50 or so from Kentucky. While featuring many of the type things you’d expect at the Broad Ripple, Penrod, or Talbott Street Art Fair, we also saw lots of unique art, jewelry, and Indiana foods. Indiana chocolatiers, pastry, wine, noodles, sauces, and much more give the Marketplace a real fun twist compared to other art shows. Zach Medler ’01 is working as a full-time artist with a studio in Portland but lives with his wife in Lafayette. Medler’s art stands out as unique in a setting full of obviously talented people. You can learn more about the unique process he uses on the links below. Medler was an independent man and religion major at Wabash. His hometown is Portland. See more about Zac’s art work on his website or follow his efforts by “Liking” his Facebook page! His exhibit “Locality” was the main event in August at the Lala Gallery in Lafayette. The exhibit included ceramics and found objects, mixed-media pieces “cobbled together” into patchwork “canvases.” Here is a link to an interview Zach did with Lafayette television about that exhibit. Jim Amidon — Here in the Public Affairs Office at Wabash College, we spend most of our time celebrating in words and photos the achievements of Wabash’s students, faculty, staff, and alumni. We focus our attention on those within the community who publish academic papers, present lectures, sing in the Glee Club, and the men who score game-winning touchdowns. Through Wabash Magazine, we similarly celebrate the accomplishments — personal and professional — of our alumni around the world, and raise their voices in the magazine’s pages. On rare occasions, I have the opportunity to focus the spotlight on some of my colleagues in Public Affairs, too. And it was a really good week for four of my colleagues. Kim Johnson, who is our communications and marketing specialist but does more design and photography work than anything, received special recognition from Lt. Governor Becky Skillman. Kim was selected as one of 11 winners of the Fourth Annual Celebration of Hoosier Women Artists competition. The contest is conducted annually in March to coincide with National Women’s History Month. 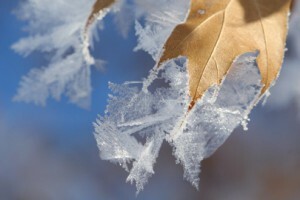 Kim entered a photograph, “Winter Frost,” in the competition, which included 140 Hoosier artists. That same photo was honored at the Art League’s fall exhibition, and President and Mrs. White selected it as the image for their annual holiday card. Kim and the other award winners were welcomed to the Statehouse a little over a week ago for a reception and tour, and all of the award-winning pieces were on display. Those same works will now be moved to Lt. Governor Skillman’s office, where they will be exhibited for the coming year. Steve’s in his 16th year editing our award-winning magazine. In his Chapel speech, he referred to himself as a sociophobe — someone who fears large crowds, especially speaking in front of large groups. But Steve soared as a speaker Thursday morning, and his message to students — Show Up — resonated with everyone in attendance. While Steve wove brilliant prose throughout the 30-minute talk, I’ll sum it up this way: His advice to students was to tell the truth, pay attention, don’t anticipate the outcome, and show up. The last bit — showing up — was his main point, and he meant it in the broadest possible way. Show up for yourself, show up for your family, show up for those you care about, and show up for life. His message is important to all of us, but especially coming from someone who has to overcome anxiety in order to show up at anything. And knowing that Steve has showed up for literally hundreds of Wabash events and thousands of Wabash people, it’s a most salient piece of advice. Also on Friday, Brent Harris, our stalwart Sports Information Director at Wabash, packed his bags for Indianapolis and the Women’s Final Four. Just as he has done so many times over the last two decades, Brent gave of himself — volunteered his time over five days — to make sure all of the little things that almost nobody ever sees at the Final Four got done… and done well. He escorted coaches, players, cheerleaders, and VIPs through the labyrinth of hallways of Conseco Fieldhouse. He granted strange requests, performed the oddest of duties, and he did all of those things with his usual grace, kindness, and good humor. Finally, on Saturday, Howard Hewitt traveled to the state college journalism convention with several student journalists, photographers, and cartoonists. Hewitt manages our website content, but also spends a large amount of his time working with and advising our student journalists. 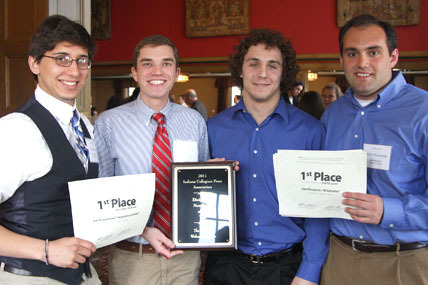 A couple of years ago, The Bachelor was named the best small college newspaper in the state by the Indiana Collegiate Press Association (ICPA). The paper has since been bumped up into a category that includes universities three or four times the size of Wabash — and all of those schools have journalism courses, faculty, and programs. Wabash has no journalism courses or faculty; Wabash has Hewitt and a bunch of dedicated students who put in long hours week after week throughout the year. On Saturday, nine students received 22 awards at the state conference, including 10 first place awards. The Bachelor was also named the best small college newspaper in the state for the second time in three years. You can read about those students on the College’s website today. As their supervisor, I couldn’t be more proud of the Public Affairs team, which includes Karen Handley, Kim Johnson, Howard Hewitt, Brent Harris, and Steve Charles. They spend all of their professional lives honoring and celebrating others. It’s my pleasure to turn the spotlight on them and say “congratulations” for their individual accomplishments and what they mean to Wabash College.